Bull Trout, the apex predator in any mountain stream. 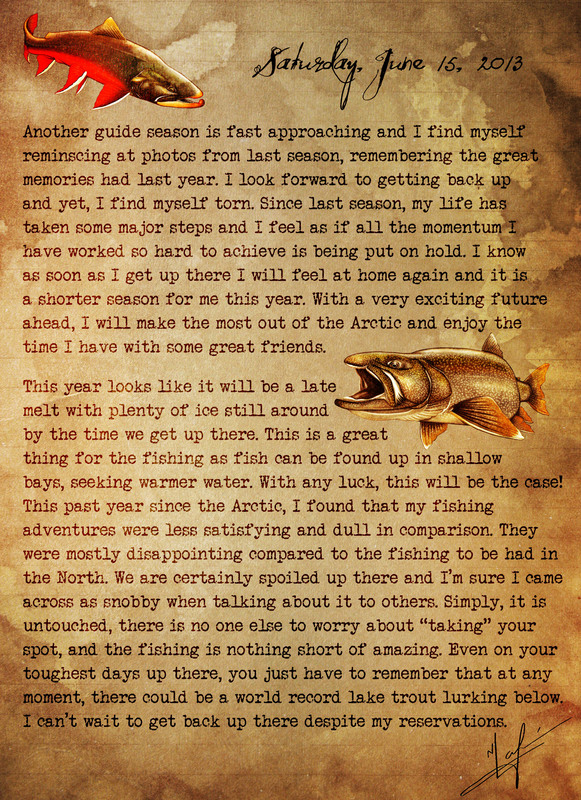 Stories from anglers of giant bull trout slashing at their hooked cutty are of the plenty. Their size, their aggression, and their attitude make them one of the most gnarly of the trout family, and are unfortunately forgotten in the art culture of fly fishing. Here’s a Bull Trout piece I did solely on the WACOM tablet thru Photoshop. This entry was posted in Uncategorized and tagged alberta, art, artwork, british columbia, bull, char, digital, drawing, fishing, fly, laferriere, mountain, nick, old man, oregon, painting, river, salvelinus, stream, trout, washington, watercolour on January 10, 2014 by nicklaferriere. At the top of the world, in the seemingly desolate Arctic, there’s a river that gleams from the barren tundra landscape. An aquamarine blue stretch of water is home to the world’s largest char in the world. These super-sized char are actually a strain of Salvelinus malma or commonly known on the West Coast as Dolly Varden. These fish are anadromous and exit the river every spring to go feed in the ocean. Late summer, the char start piling back into their home waters to spawn and spend the winter months. Unlike the Pacific Salmonids, char are able to spawn for multiple years and have been sampled and aged to live upwards of 45 years. The Tree River char have also been tracked to travel as far as Greenland to feed, before returning back to the same river to over-winter. Unlike other Arctic fishes, char lack a natural anti-freeze in their blood that enables them to withstand the winter in the salt. Because of this, the char must return to the river every winter or they will freeze to death. Late summer the Tree is dotted with bright red char that resemble Ferrari’s. The Tree River char are known as the largest char in the world and the current world record was caught and released there. The contrast of a fluorescent red char in the aquamarine blue waters of the Tree River are a sight one can’t explain. A worthy adversary, the char is a master at heading for white water and spooling its opponent. This entry was posted in Uncategorized and tagged arctic, art, artwork, char, dolly, drawing, malma, nick, nick laferriere, painting, river, salvelinus, tree, varden on April 23, 2013 by nicklaferriere.